The Middle East is a a cauldron of deeply-rooted conflict. Check here for the latest news. President Donald Trump’s quite literal bombshell decision to move the US embassy in Israel to Jerusalem threatens to destabilize a region already teetering on the brink of chaos. Such choice may just spark the final fire in the Middle East. Moving the embassy from Tel Aviv to Jerusalem has long since been in Mr. Trump’s wish list. He even made a campaign pledge out of it. Israel supported the idea all along, but previous US presidents had enough common sense to defer such move, recognizing the potential for catastrophic consequences in the region if it came to pass. Trump’s decision has been received with dismay, widespread condemnation, and fierce criticism worldwide. Palestinian organization Hamas has gone a far as saying that Trump ‘has opened the gates of Hell’ by publically and internationally recognizing Jerusalem as the capital of Israel. Elsewhere, Iran has issued a statement to say that it is likely to spark a fresh uprising. Israel’s Prime Minister Benjamin Netanyahu meanwhile referred to the decision as a ‘historic landmark’. Jerusalem is, and has been for a long time, a divided city. Jerusalem’s east side -the Old City- had been under Jordanian rule up to 1948. Israel occupied it by force during the Six Day War in 1967, and annexed in 1980, in a move that sparked international outrage. The issue remains that, under the laws of the Geneva Convention, any territory that is occupied by military means does not have international recognition of ownership. Therefore, controversy still rages about which side owns Jerusalem’s east side. Why Jerusalem is at the center of such division? Both Israelis and Palestinian claim the city as their capital. This has been a source of tension for generations. There are deeply entrenched fracture lines running just beneath an uneasy truce that Mr. Trump’s decision threatens to shatter with a single stroke of the Presidential pen. Officially endorsing Jerusalem as the capital of Israel will have several, quite severe and far reaching consequences. It will put a swift end to the protracted peace process in the region, for starters, which will likely lead to renewed waves of violence. Also, it will mean that President Trump has taken it upon himself to determine the fate of such troubled city, ignoring the plight of millions, and unileraterally blasting decades of careful negotiations. Eighty six countries have embassies in Tel Aviv. None in Jerusalem. Almost 900,000 people live in this contested urban enclave, roughly split in 37% Arab and 61% Israelis. They live in the knowledge that their version of peace rests on a knife’s edge, and Donald Trump’s decision to move the US embassy from Tel Aviv to Jerusalem is likely to cause that dormant blade to cleave the region for good. Though obscure by dust and dirt thrown into the air by continuous shelling, the Mosul low-rise skyline is within sight of forward elements of Iraqi special forces, the American-trained Counter Terrorism Force (CTF). CTF operatives are now about 1.2m away from the outskirts of ISIS-controlled Mosul, and scouts report militia fighters darting in between houses, and heavy concentration of vehicles in the area. These vehicles are suspected to be packed with explosives, ready to ram advancing forces. Iraqi mortar teams are maintaining a constant bombardment on ISIS-held positions, to disrupt staging and reduce battlefield morale. The situation on the ground is tense, as ISIS militia know that losing Mosul will mean their inevitable end. The city had been designated to be the capital of the new, so-called ‘caliphate.’ A decisive victory for the Iraqi-led coalition here will certain spell ISIS’ demise in the country. A bitter, bloody, and costly struggle awaits the coalition troops. ISIS have recalled hardened fighters into the city, and conservative estimates put the number of civilians still trapped inside Mosul in the tens of thousands. ISIS have been known to massacre personnel attempting to flee the city, including women and children, and use civilians as human shields to deter direct confrontation. Morale is said to be high among Iraqi troops, with many no doubt seeking retribution from years of ISIS oppression. The final assault on Mosul is expected to begin soon. Military observers on the ground around the besieged city of Mosul in Iraq report a large number of civilian casualties, allegedly inflicted by ISIS militia. The bodies of at least 120 civilians have been discovered inside houses and in shallow graves, most of them with multiple gunshot wounds. It remains unclear which faction carried out the killings, however. Some 5,000-6,000 were dug in around Mosul at the outset of the battle. Vastly outnumbered by a coalition of around 90,000, ISIS militias have sustained heavy losses since the start of the offensive, though they are fighting doggedly to retain control. The bitter struggle for the city is thought to be ISIS’ last stand in Iraq. The jihadi fighters have mined all access to the city with Improvised Explosive Devices (IEDs) and laid booby traps all over, creating a hazardous environment indeed. Specialist engineering teams are on the ground, but progress is slow, and clearing has to be done house by house. The fourth day of ground operations around the northern city of Mosul in Iraq got underway today. Led by Iraqi special forces, army units opened a third front to liberate the city from ISIS control. Iraqi troops, supported by Kurdish army elements, US air assets, and other mixed militia, have so far made large gains in terms of terrain recaptured, but report heavy resistance from ISIS fighters. The city of Mosul, considered by ISIS to be the capital of their so-called caliphate, has remained under ISIS control for over two years. According to troops on the ground, the city is heavily booby-trapped, and fighters are putting up a stiff resistance. US attack helicopters strafed ISIS positions to support Iraqi army units on the ground yesterday, it was reported, and nine suicide trucks loaded with explosives were destroyed before reaching their objectives. An US serviceman was killed on Thursday, the first casualty of the Mosul offensive. Meanwhile, an estimated 200 ISIS fighters have so far been killed. It is thought that the ISIS garrison within Mosul includes around 5,000 fighters. Facing them, there is a coalition of over 108,000 troops. While most Irish housewives use their pots to cook cabbage and the like, things inside the kitchen are somewhat more complicated in the hellish, war-torn Middle East. Enter 39-year-old Wahida Mohamed, better known as Um Hanadi. 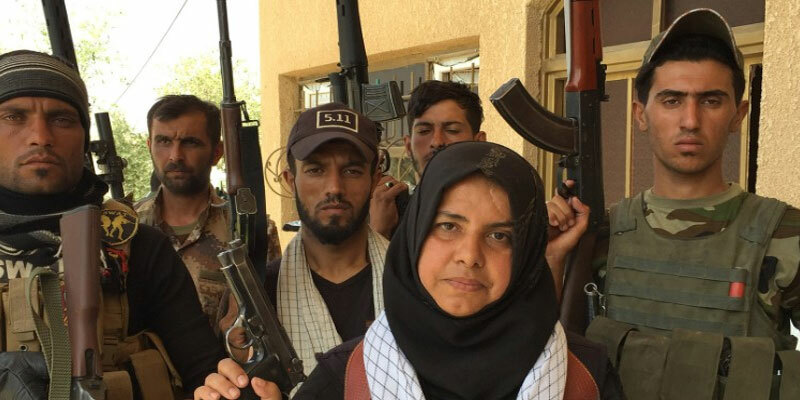 After losing two husbands, several family members, and some domestic animals to the savagery of ISIS, the self-declared ‘housewife’ vowed to take revenge and wage brutal war against her foes. Commanding a 70-strong, all-male militia, no-nonsense Um Hanadi now strictly applies the ‘eye-for-an-eye’, or rather a ‘head-for-a-head’ policy. Any ISIS fighter or prisoner that falls to her group is beheaded, and the head is cooked inside a slow-burning pot. Having struck fear in the heart of ISIS, Um Hanadi is now at the top of their kill list. She has reportedly survived six assassination attempts thus far, and her body is riddled with shrapnel after car bomb attacks. She bears a 15-shot 9-mm Beretta sidearm at all times. ISIS operatives are particularly bent on taking her out, as they believe that being killed by a woman tears up their ticket to heaven. The city of Mosul stands on the banks of the Tigris River as it runs through northern Iraq. It once was a prosperous industry and transportation hub, producing marble and oil. Crucially, the city has huge strategic value, as it controls a highway that runs to the border with Syria and its second city, Aleppo. During the 2003 invasion of Iraq, Mosul remained under the control of troops loyal to Saddam Hussein until April of that year, when the local garrison fled. Uday and Qusay Hussein, the dictator’s sons, were killed during a shootout with Coalition forces in July. Civilian US contractors moved in after Mosul was secured and implemented an extensive programme to rebuild the city’s infrastructure, which had been largely destroyed during fighting. The rise of ISIS in subsequent years brought widespread turmoil and unrest to Iraq, and many intellectuals, engineers, journalists, and other people of significance were either killed or forced to leave. ISIS took full control of the city in June 2014, forcing the evacuation of up to half a million people. The extremist organization systematically massacred the scattered remnants of the Iraqi army, seizing large amounts of US-manufactured weapons and equipment in the process. Mosul has remained in ISIS hands ever since. Now, a coalition of US and Iraqi forces is preparing to mount a large-scale ground offensive in an effort to drive ISIS out of the city for good. There is a perception that ISIS are on the backfoot, and that their morale is waning in the wake of recent surgical drone strikes that have taken out key tier one personnel within the organization. 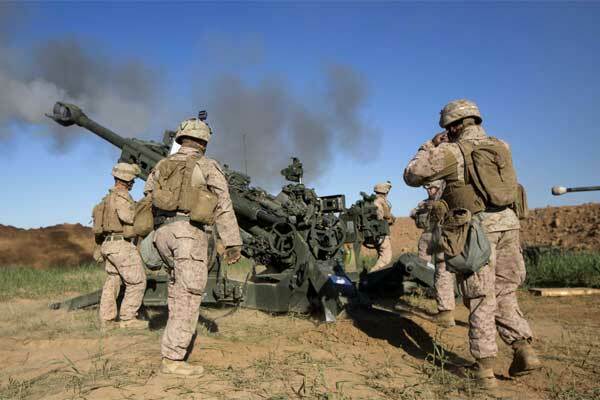 President Obama has authorized dispatching 600 extra troops to the area, thus increasing the number of US forces on the ground to just over 5,200. Though a significant number, it’s still a far cry from the 170,000-strong US army present in Iraq during the height of the conflict in 2003. The ground offensive is expected to begin in the next few weeks. The war-torn city of Aleppo in Syria has come under heavy bombardment once again, after a fragile ceasefire collapsed. Five aircraft, said to belong to the Russian air force, flew over the city yesterday, dropping heavy weapons on rebel-held areas. Local reporters said that cluster munition and incendiary ordnance were used during the latest attack. The city of Aleppo has largely been under rebel control since 2012. Forces loyal to Syrian President Bashar al Assad have maintained a constant siege ever since. 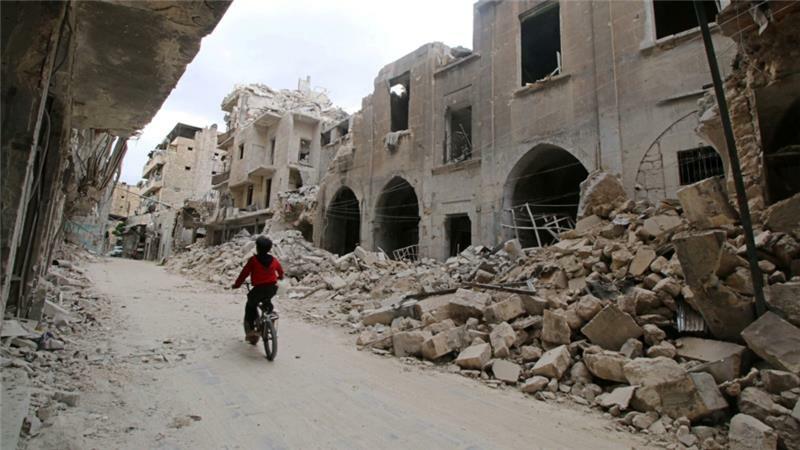 The latest ceasefire effort all but ended after a convoy ferrying humanitarian aid into the besieged city was bombed on Monday, killing 20 people. The ceasefire deal brokered through a joint US-Russia diplomatic effort appears to be all but over today, after renewed airstrikes destroyed a number of vehicles inside a humanitarian convoy, and killed four medical staff and a number of civilians in a clinic. According to the Syrian Observatory for Human Rights, the airstrikes occurred in a village near Syria’s second city, Aleppo, late last night. A makeshift medical center was hit, killing at least four doctors and a group of civilians. This latest atrocity appears to lay waste to the tenuous ceasefire in the region. 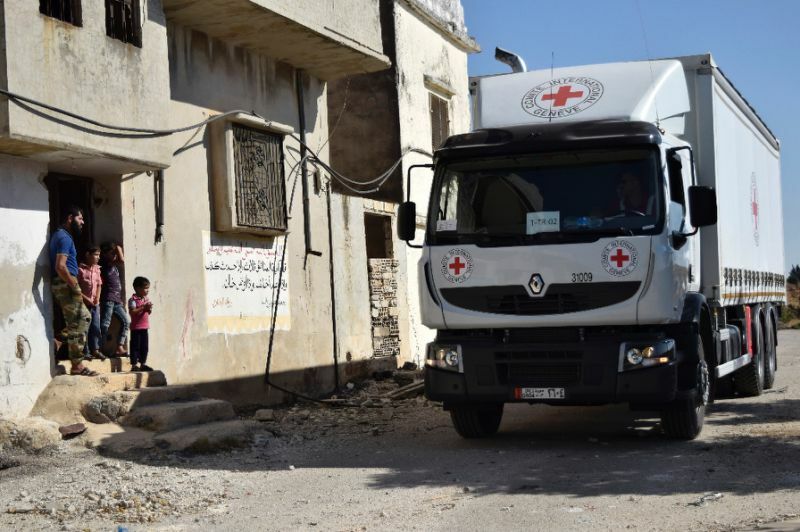 It emerged yesterday that a convoy ferrying humanitarian aid into war-torn territory around Aleppo was hit. Eighteen trucks out of a 31-strong convoy were destroyed, dealing a hammerblow to the ceasefire. A number of airstrikes across the Syrian cities of Aleppo and Idlib killed at least 58 people yesterday, with 13 children among the dead. The airstrikes took place hours after US Secretary of State John Kerry announced a ceasefire deal reportedly backed by the Syrian Government. It appears that both sides in the conflict are moving fast to consolidate their positions in the war-torn country ahead of the ceasefire, which is due to commence at sundown on Monday. If the ceasefire holds for seven days, US and Russian military units may turn their weapons on al-Nusra, a terrorist group associated with al-Qaeda operating in the area. There have been several ceasefire agreements in the past, but they have always failed after either side failed to uphold the conditions. 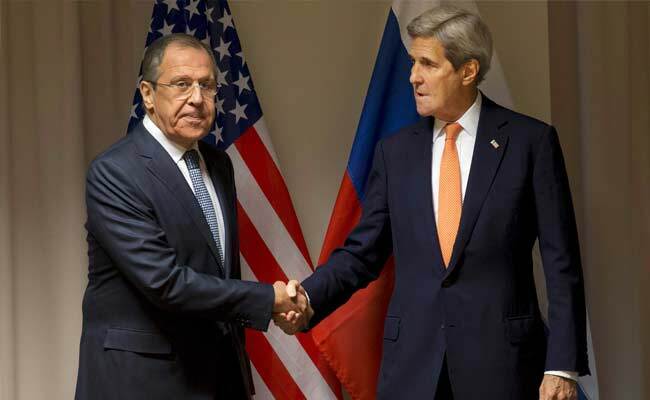 Speaking in Geneva, Switzerland yesterday, US Secretary of State John Kerry said that the Syrian Government has now backed a ceasefire deal brokered by both the US and Russia. The deal calls for a ceasefire in the war-torn city of Aleppo to start at sundown on Monday, September 12. If the ceasefire holds for seven days, US and Russia forces will turn their sights against al-Nusra, an al Qaeda-affiliated terrorist organization. Meanwhile, violence still raged on across Aleppo, a now ruined city divided into sectors controlled by opposing factions. So far, Syrian forces backed by Russian airpower have pounded the rebel-held strongholds, causing grievous losses to civilians in the process. Syrian army units launched an offensive shortly after the ceasefire announcement was made, presumably in an effort to maximize territorial gains before the Monday deadline. 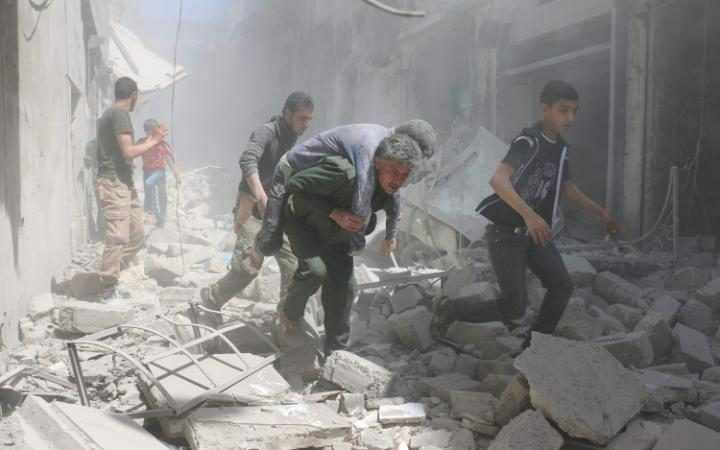 The Syrian conflict has so far taken the lives of an estimated 400,000 people.